In the period 1990–2014, emissions of total ozone precursors decreased by 51%. 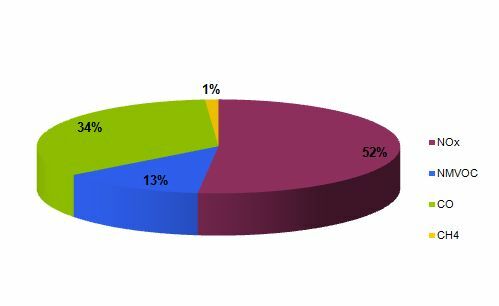 Emissions of nitrogen oxides decreased by 42%, carbon monoxide by 67%, non-methane volatile organic compounds by 56% and methane by 20%. The decrease is mainly a consequence of the introduction of more stringent emission standards for motor vehicles. This measure contributed to a significant reduction in emissions of nitrogen oxides and carbon dioxide from road transport, which is the main source of ozone precursors. 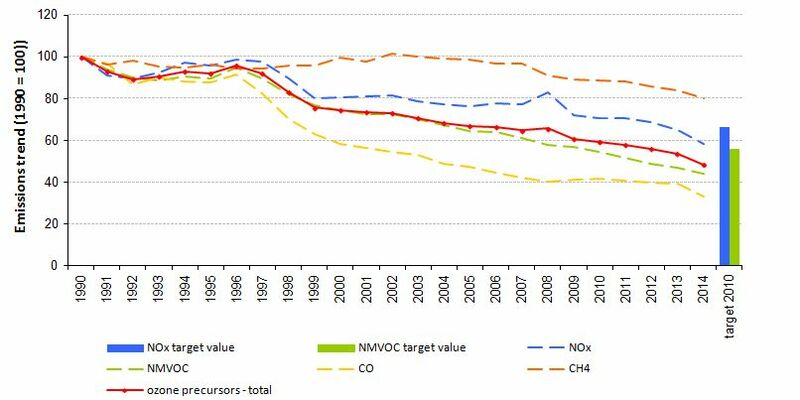 In 2014, emissions of nitrogen oxides and non-methane volatile organic compounds were below the prescribed target values that are not to have been exceeded from 2010 onwards. Notes to table ZR10-4:1- Data for Greece are not availible.2- Data from EEA are from 2013, the rest are from 2014.